Weakness results primarily from disorganized neuro-motor output and is one of the most significant post-stroke impairments. In fact, weakness plays more of a role than traditionally believed and contributes directly to compromised, post-stroke motor function. Typical strengthening approaches use resistance bands such as TheraBand™. Unfortunately, because this method does not ensure sufficient intensity or progression of the strengthening activities required to achieve necessary overload, hemiparetic patients seldom show improved function. In addition, trunk stabilization is often not properly addressed, which promotes compensatory movement patterns. It’s important to note that neither high exertion nor resistance training exacerbates spasticity. Therapeutic outcomes are improved when the motor capacity is enhanced prior to engaging in repetitive task practice. Approximately five times lighter than stainless steel. Proven biocompatibility suppresses the risk of allergic reactions caused by the release of metal ions. Therapeutic intervention using neuromechanical capacity (strength) in the repetitive practice of close-to-normal movements can directly address weakness and effectively restore motor control. Lower extremity resistance exercise, more commonly prescribed post stroke, has demonstrated improvement in functional tasks for rising from a chair, walking and stair climbing. Increasing strength for the upper extremity in hemiparetic patients has only been recently been studied. 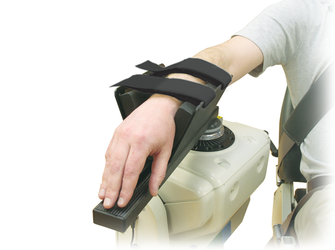 Sliding pads accommodate limb length and any impaired scapulohumeral rhythm. Lightweight to negate gravitational load. 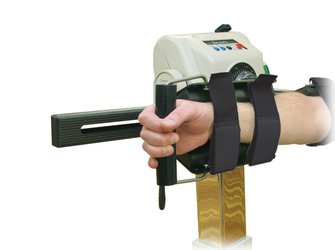 Comfortable secure stabilization is ensured without the need to grasp a handle. However, a handle is provided to encourage the preferred thumbs up “full can” position which has a much lower risk of causing shoulder impingement-type symptoms. 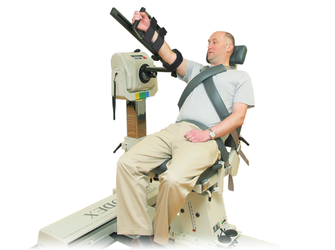 Uses the same attachment and adjustments as abduction/adduction. 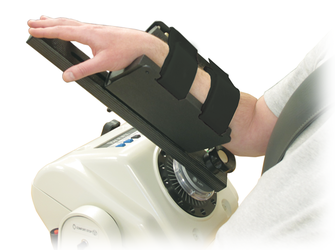 Supports the weight of the forearm with an integrated armrest pad. Isolates internal/external rotation in a modified position. Uses the same attachment as shoulder internal/external rotation. Isolates flexion and extension in the transverse plane, negating the effect of gravity. Positions wrist so the pattern can be performed in the transverse plane, negating the effect of gravity. The Upper Extremity Hemiparetic Attachments combine traditional functional task activities with dynamic-resistance training (power training) of isolated joint, and eccentric and concentric training on the Biodex Multi-Joint System. 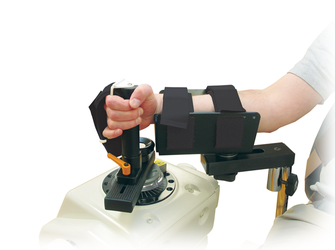 These specialized attachments accommodate the impaired grasp associated with hemiplegia. A 65-year-old right-hand dominant female presented to a target research program at the Neural Control of Movement Laboratory, Palo Alto VA Research and Development Center 16 weeks following clipping of an unruptured aneurysm with consequent right hemiparesis. Patient received 49 days of acute rehabilitation (according to CARF guidelines) of which 29 were acute inpatient rehabilitation days and ten were spent in an outpatient day rehabilitation program. The comprehensive rehabilitation program included physical therapy, occupational therapy and speech therapy. All disciplines targeted different levels of the International Classification of Functioning, Disability, and Health (ICF) including: body structure/function, activity, and participation. The Stroke Impact Scale score reporting her perspective indicated she had recovered from her stroke only 50%. The hybrid resistance training-functional task practice intervention, detailed in the referenced research study, was delivered three times per week for six weeks, with each session lasting 75 minutes. The subject revealed marked improvements in isometric and dynamic force production in five key upper-extremity actions: elbow flexion, elbow extension, shoulder flexion, shoulder abduction and shoulder external rotation. Strength gains were accompanied by increased EMG activation immediately post intervention and by a combination of increased activation and apparent hypertrophic effects at six month follow up. Marked improvements were noted in all clinical and functional measures. Improvements in strength and positive outcome effects at the physiological, clinical and function levels were observed in this subject following the experimental hybrid upper extremity rehabilitation intervention described. Importantly, no deleterious effects were observed including exacerbation of spasticity or musculoskeletal compromise. Observations of improved EMG activation in this case study suggest that improvements in motor activation underlie these strength gains and can likely be attributed to working at a high-intensity level. 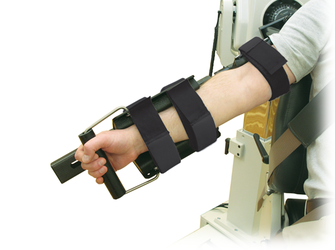 Biodex Upper Extremity Hemiparetic Attachments are compatible with Biodex System 3 and System 4, Pro, MVP and Quick-Set models.